Metropolitan modern curtain rod finial. Use with tab top curtains, eyelet curtains or pinch pleat draperies. 2 1/2" H x 4 1/4" D.
Metropolitan modern curtain rod bypass ring. Use with pinch pleat draperies to allow drapery to pass by the support brackets on wide installations. 1 5/8" ID x 2 1/8" OD. Use with tab top curtains, eyelet curtains or pinch pleat draperies. 4 foot smooth 1 inch metal curtain rod. Metropolitan modern curtain rod look. Metropolitan modern curtain rod finial. Use with tab top curtains, eyelet curtains or pinch pleat draperies. 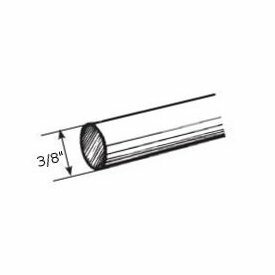 3 5/8" L x 2 1/8" W.
Select wood curtain rod pole 1 3/8" diameter, 4 feet long. Available in 4,6,8 and 12 foot lengths. Ten colors to select from plus unfinished. Base Price is for unfinished rods. Colors will show price in the cart. Note: 12' rods have to be shipped by truck. BasicQ Inc. -- Altran Drapery Hardware: "
Altran Metal Curtain Rods in contemporary and wrought iron styles are available in 3/4 inch and 1 3/16 inch diameter. Pole lengths from 59 inches to 118 inches with a connector to extend even longer. Brackets, finials and rings to match available finishes. Use with pocket top, tab top, tie top and grommet to curtains or use pinch pleat draperies with rings. For a modern look or a rustic look, Altran has it all." Made of vinyl coated fiberglass yarns. 5 percent openness factor makes this roller shade fabric perfect for windows that require more privacy. 6 foot fluted wood curtain rod 2 1/4 inch diameter. Decorative curtain rods for any window. Renaissance Collection by Design Elements. drapery hardware includes everything from basic curtain rod sets to custom assembled traverse rods to fit your exact size. All products are supported with replacement parts available in small and large quantities. Quantity price breaks by Kirsch are passed on to you, the consumer. Support data is available in abundance from support section and from the Kirsch web site, www.kirsch.com. Functional basics that do the day-in day-out duties of displaying our curtains and draperies on our windows and doors. Traverse rods with cord or baton controls are available up to 312 inches in width and come in one way draw, left or right, and center open and close options. Lock-seam or open curtain rods in single, double and triple configurations suitable for pocket curtains and valances. Continental rods come in 2 1/2 inch and 4 inch face sizes and are execellent for the tailored look you get when fabric is sheered onto the rods. Sash curtain rods work on doors with windows, like the French door. They are designed to mount close to the surface of the door on top and bottom of the glass, holding your curtains in place when the door is opened and closed. Also available are specialty rods for corner and bay windows, arched, circular or octagonal windows. A wide assortment of complimentary accessories to finish the project is available including brackets, rings, drapery pins and more. The 9046 series Kirsch Architrac system can be used for hand drawn pinch pleated draperies, ripplefold draperies, accordia-fold draperies and grommeted cubical curtains as seen in many hospital rooms. This system measures 5/8" wide by 1/2" high and is made of .070 extruded aluminum with a white finish. This track can be bent or curved to fit in corner, bay or bow style windows and allow complete operation around the 12 " radius bends. System is lubricated with Kirlon for friction-free movement of the carriers. 2 inch Kirsch designer metal Pandora finials for designer metal curtain rod poles and traverse rods. 1 3/8" Bypass C-ring that coordinates with designer metal curtain rod poles. Clip is removable for use with standard drapery pins. Antique white finish, includes mounting hardware. A cafe curtain rod by Kirsch.